Four of Pentacles relate to the material world it becomes rapidly obvious that this person is obsessed with money or his possessions. This man sits on a stone seat with a town in the background. A Pentacle rests upon his head. He holds another like a shield at his chest. Below his feet rest two more Pentacles. His face looks tense and strained. The Pentacles are large and quite solid-looking. He keeps a tight hold of them, so we must assume they are very valuable and of great importance to him. To him they might even be the most important thing in the world. 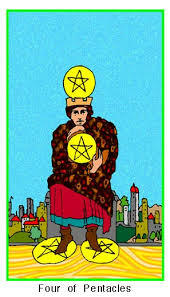 The Pentacles are in his hands, on his heart, under his feet and on his mind. He clutches one of the Pentacles to his chest and holds on tight, afraid that someone may try to take it from him. We wonder if he ever takes a break from guarding his things or God forbid, share them with someone else. His crown means only one thing and that is he is the ruler or owner of a substantial empire. He is building success upon success and is known to have the ‘midas touch’. Anything he touches turns to gold. The Four of Pentacles is a person that may deliberately isolate himself. He may prefer money and his things to people or company. The Figure in this card may find that his need for having and possessing make him appear greedy and lacking in compassion. He wears a dark brown habit with a thin blue band on the hem. The predominance of brown suggests his connection to the Element of Earth and the material world. However, over this he wears a black cloak. He will have to learn that money cannot buy everything, especially happiness. A hoarder and collector, this man finds it difficult to let things go, even himself. When it comes to love this card is about FEARS of lacking material gain; and extreme need to control another person. If you are single and think that you are ready for a relationship, realize that you will undoubtedly have to step outside your comfort zone to make it happen. True love will not just drop out of the sky. You have some understandable anxiety about money and are trying to hold on to every penny. Greed and selfishness with money. Savings – Investment – Financial Security – Controlling – Selfish, Selfishness- Stingy – Greed.